With so many marketing channels to select from, and normally limited budget dollars to spread them around, I’ve taken a look at factors that align marketing channels with your customers. It’s the subject of my most recent blog at Target Marketing Magazine. As I began my quest for information, my research started with consumer preferences. There are a lot of studies available. Some studies say customers prefer direct mail. Others email. And while customers love social media, they don’t have a lot of love for marketing messaging via social media. In reality, I think customers and prospects, through their interaction with you, will tell you what you need to know. Knowing those metrics is the hallmark of direct marketing. Still, as I did my research I came up with five qualitative factors and a “bottom line” quantitative factor for marketers to consider. 1. Pure-play sales marketing vs. content: content marketing gives us a mask to go out and pretend we’re helping our customers, when in fact, our ultimate goal is to sell them something, isn’t it? Still, if the content and information is sincerely helpful, customers won’t care. Where they do care is if there is a switcheroo from education to blatant sales pitch. I see it happen all the time, and as a consumer, it ticks me off. 2. Time sensitivity. If you message has time sensitivity, email is the route to go. Yet, before the age of email, as direct mail copywriters we had to make the message feel urgent to generate response before the prospect cooled. 3. Shelf life. Direct mail has a longer shelf life, especially important for merchandise marketers close to the holidays. Email can vanish in a click. Direct mail can be pitched into the trash bin. Higher production value catalogs and direct mail may be held onto longer than down-and-dirty printed packages. And higher production values (such as colors, textures, folds, tip-ons, stickers, die-cuts, and the visual impact of an 11x17 fold-out brochure) are impossible to convey in an email. 4. How did they get my name? Customers probably won’t be as concerned about privacy, but prospects can be much more sensitive to wondering how their name and address fell into the hands of a marketer. This can be an issue if your offer is in health or personal finance. The trust factor is huge in prospects taking an action to pursue learning more about you, or making a purchase decision. 5. How do I know you? Prospecting is tough these days. It’s expensive. An inbound marketing strategy can be very effective, but takes time, cultivation, and nurturing. Social media can be effective. Content marketing is proven to be effective for many marketers. Content marketing, using a variety of online channels, can be a game-changer for you. 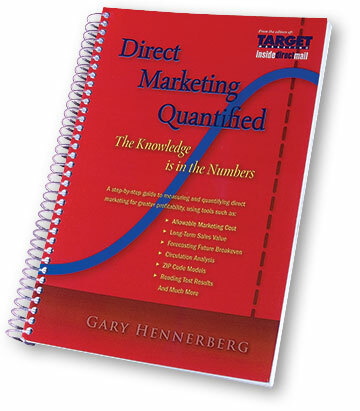 As for quantitative factors you can use to align direct marketing to the media, there is really only one set of numbers to evaluate: Sales and cost per order (or per thousand). As an internal metric, when you evaluate your sales and cost per thousand, you can identify the ultimate metric to assess how your marketing messaging aligns with results. The bottom line is this: when you measure sales, response, engagement and other metrics, your prospects and customers are giving you all the signals you need to know how to align marketing with your customers.